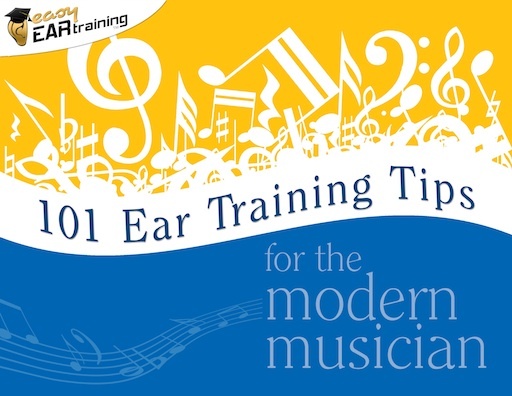 “101 Ear Training Tips for the Modern Musician” is the new eBook with 101 tips, tricks, and fresh ideas for keeping your ear training fun, easy and effective. Get tips for all the core types of ear training: Music Appreciation, Practicing, Active Listening, Audiation, Intervals, Chords, Relative Pitch, Scales & Modes, Rhythm, Improvisation, Playing By Ear, Singing… and some general hints and advice for developing your musical ear. For example: Working on interval ear training? Or maybe you want to practice chord ear training so you can play by ear? You can harmonise any melody based on the major scale using just the I, IV and V chords – because those three chords together include all the notes of the scale. Try it! Or maybe you just need a bit of inspiration to keep stretching your music learning in new directions? Take them home and listen through, and then read about what you’ve heard. Look at the CD booklet, or look up the artist or composer online. Whatever type of ear training you’re focused on, “101 Ear Training Tips for the Modern Musician” will have something to help you develop a good ear for music.